Wal-Mart took special effort this week and warned customers of an unusually ‘high quality’ phishing email that tries to get personal and credit information. They stated on their corporate site: “There was a false email sent to a number of people this morning claiming to be from Walmart.com. This email looks like a confirmation of a purchase made on Walmart.com, but is actually a phishing email attempting to gather information from the recipient,” they said in a statement. 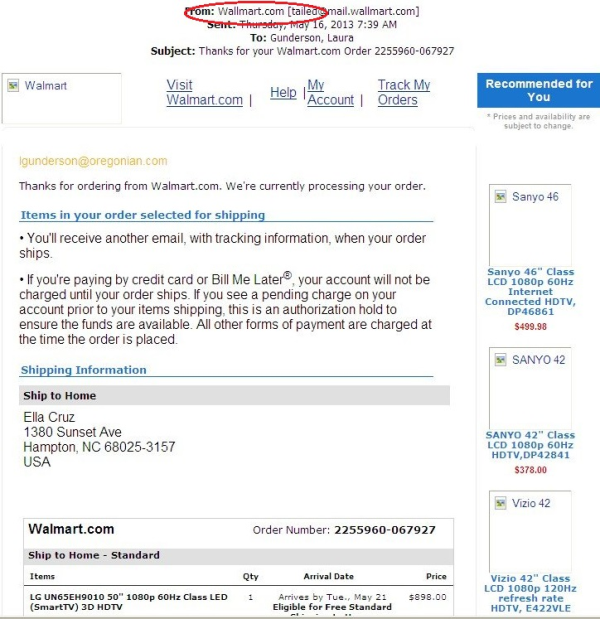 “Again, this email is not from Walmart.com and it is important that recipients do not click on any links in the email or respond in any way.” Here is how it looks, note the only immediate Red Flag you can see is the ‘wallmart’ spelling with 2 l’s in the ‘From’ address. Isn’t there an Email address to which to forward suspicious Emails? Something like “abuse[at]walmart.com”? If so, it’s pretty darned hard to find, either on line or over the phone — in fact it’s hard as HELL to get a human being when calling 1-800-WALMART!! I got this phishing mail and the spelling of WALMART was correct. I had to get a new Credit Card # by way of abundant caution. Something is not quite right. I suspect this was engineered by people possibly working for the company though I am not suggesting the company was involved. If you get an email ever asking you to login and its to do with card stuff just delete the email and login via the actual site (have it in your favourites). That way your always going to the right domain and don’t have to worry about phising emails.